15 LED 3 In 1 Ghost Flashlight 15 LED 3 In 1 Ghost Flashlight. [15 LED 3 In 1 Ghost Flashlight] - £29.99 : RemotesOnline247.com, SALE Ends Soon, We Accept Paypal, Sent Tracked!, SALE Ends Soon, We Accept Paypal, Sent Tracked! 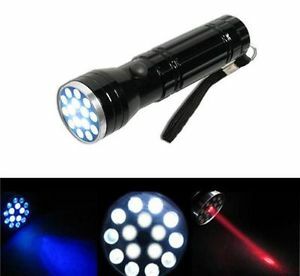 The 3 in1 flashlight has three modes bright LED, UV and Red Laser simply Change modes by pressing button. A really great & affordable piece of equipment for any investigators kit. Water resistant, shockproof, and erode prevent design. Great to use with your infrared function on camcorders. Ideal for protecting your night vision. Switching to bright torch mode for emergency use or to review evidence. Point things out in the distance using the red laser, you can also use the red laser for the laser test. Attention: Do not look directly in the LED's, which may hurt your eyes.